Recently garnering 1st Place in Class at the 2018 World Championship Cheese Contest, the LaClare Family Creamery’s Cave Aged Chandoka is one of our new favorite go-to cheeses… and we’ve got a lot of really good cheese at our access at all times! Founded in 1978 in rural Malone, Wisconsin and named after founders Larry and Clara Hedrich, the family operated and owned creamery’s foundations are rooted in the artistry of their craft, family values, and hard work. Today LaClare Family Creamery is one of the most awarded goat cheese producers in the country. Well done team Hedrich! 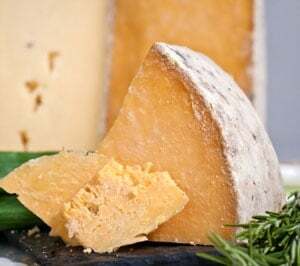 Cave Aged Chandoka is a cloth-bound New Zealand style cheddar pressed from a pasteurized whole milk blend of 70% cow and 30% goat milk, and aged at least 8 months. We’ve been huge fans of this cheese from the moment we first discovered it. Young cheesemaker Katie Hedrich Fuhrman is a bit of an up-and-coming rock star in the world of cheese, but the entire family is a big part of LaClare’s success, to be sure. They’re a farmstead operation, meaning that the goat milk used in their cheeses comes from the goats on her parents’ farm. Doesn’t get much fresher than that. The mixed milk blend makes such a really interesting combination of sweetness and rich, deep savory notes. If a sweet goat's milk gouda fell in love with a savory English cheddar and had a baby, they would name it Chandoka! It’s a mild fruity cheese, with rich cheddary notes. 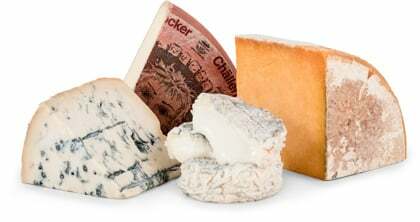 The cow milk contributes to the cheese’s sweet buttery characteristics, while the goat milk expresses in sweet tangy notes. It will more than likely to be the first cheese gone on your cheese board and is extremely versatile as an ingredient as well. Consider pairing it with Saisons, Dry Ciders, Red Ales or a hop-centric Imperial IPA. If you fancy wine, go with Chardonnay, Zinfandel, Pinotage, or Cabernet Sauvignon.